One month’s rain fell on parts of northern Britain in 24 hours – and more is expected. NORTHERN PARTS of Britain are suffering localised flooding this morning following a short period of torrential rain. A small number of residents in Lancashire and West Yorkshire have been forced to evacuate from their homes after a month’s rainfall fell over the region in less than 24 hours, the BBC reports. The Environmental Agency currently has 89 flood warnings in place across the north of England and a further 48 notices which warn of possible flooding. The Scottish Environment Protection Agency has lifted some of its earlier flood notices, but a number remain in place. The British Met Office has a ‘yellow’ weather warning in place. It is forecasting further showers throughout the day which could become heavy later this evening and tonight, meaning that the risk of localised flooding remains. Meanwhile, Met Éireann is still forecasting wet weather across the Republic of Ireland this weekend, though no flood warnings have been issued. 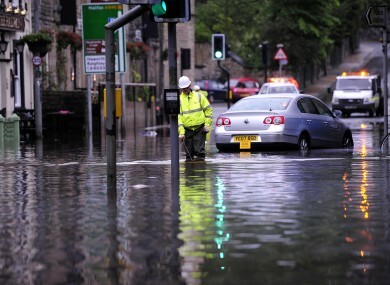 Email “In photos: flooding strikes northern England”. Feedback on “In photos: flooding strikes northern England”.